RUSH: I want to explain something. You probably have heard that Robert Mueller has the supremo reputation, of all the people inside the Beltway, of all the people in the establishment, he is beyond reproach. Robert Mueller is not tainted by bias in any direction. He’s the essence of pure fairness, objectivity, and decency. How did he come by this? Have any of you inquired? How is it possible for anybody in that swamp to come up with a reputation like this that is endorsed by all factions in the swamp? Well, I will tell you how it happened. That reputation was established when he and Saint Comey stood up to George W. Bush on a monitoring section of the Patriot Act. The attorney general at the time was John Ashcroft. He was in the hospital with pancreatitis. That’s a disease that can be fatal and for which the only treatment is not eating. You can look it up. Ashcroft was not well. There was a section of the Patriot Act that Bush was insistent on including warrantless wiretap searches of known and suspected terrorists. Comey was the deputy attorney general. He was not Saint Comey yet. He was the deputy AG, and he and Mueller went to Ashcroft’s hospital room and forced Ashcroft to sign an indictment that they sponsored opposing Bush on warrantless wiretaps. That’s all it took. 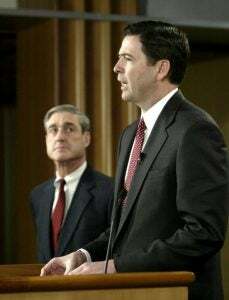 All you had to do to gain the approval of the swamp is to go in there and stand up to George W. Bush, and that’s what Mueller and that’s what Comey did. And Mueller’s reputation since then, impeccable, unassailable, said to be straight down the middle, the guy has run the FBI. He’s run the CIA. I don’t think so. But he’s capable of running all these things. So that’s the origin of his untouchable, unblemished, unpockmarked, except for his varicose veins, which you wouldn’t want to see an aerial shot of. It’s the only thing that gives the guy any color. That’s way back in 2002, 2001, whenever Ashcroft was ill at the time. And that reputation has survived. Now, this guy Mueller has staffed up with as many anti-Trump, anti-Republican. He’s got a bunch of Obama lawyers, a bunch of Hillary lawyers who’ve also been fundraisers, bundlers, big time donors. And there’s no parameters on this guy’s investigation. There were no limits put on where he could go, what he could do. He’s gonna find a crime if it’s a process crime. He’s looking into Trump’s business procedures and practices back in 2008. There’s no stopping the guy. It’s out of control and it needs to be brought under control big time.